It’s low in fat, it has some carbs, some protein, even a gram of fiber, and – hello – it has chocolate! This Trader Joe’s version is even fortified with vitamins. It’s perfect to replenish what was lost during a run. 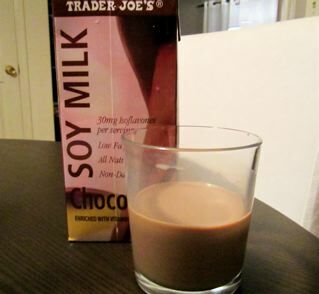 I’m going to try and double up my miles this week and am probably going to need something a little more than chocolate soy milk. Any suggestions? How long are your runs? If it’s less than an hour, then replenishing on carbs and glycogen stores is probably less important (even electroylytes can be foregone in aerobic sessions which last less than an hour). My short runs are about 3 miles and I get ‘er done in about 30 minutes. Right now, my long runs are 6 miles and they take me a little over an hour. I’m trying to work up to the full 13.1 so I would love some feedback on the issue of what to eat or drink after. Any aerobic exercise that lasts around an hour doesn’t necessitate a great deal of sustenance, as glycogen stores generally only become depleted during endurance events (running for hours at a time). The best thing to do would be just to drink water, or if you’re jogging during extremely hot weather perhaps an electrolyte solution is advisable during and after exercise, but not Gatorade or those extremely sweet sports drinks, far too many calories. You can get relatively moderate electrolyte sachets from a chemist, or even make them yourself with glucose powder and salt – in the right quantities. Also, have you heard of high intensity interval training? Depending on what your goals are (are you training for endurance?) you might be interested to look into it, it’s a great method for weight loss – I use it myself to stay trim and lean. How long are your runs? Electroylytes and replenishment of carb/glycogen stores can be, for the most part, foregone if aerobic periods don’t last more than an hour. Thanks Jason! Great tips! I have tried high intensity interval training and it’s no joke. I like making my own electrolyte drinks, too. I almost always have to drink something a little salty becauseI get really bad headaches from my sodium levels getting too low (at least the what my doctor said). I usually makea drink of mostly water or coconut water with a little bit of salt and fresh lemon juice – way better than that Gatorade stuff.